*Corresponding author: Sabra Botch Jones, Boston University School of Medicine, Biomedical Forensic Sciences, 72 E. Concord St., L815B, Boston, 02118. How to cite this article: Botch-Jones, S., LeBlanc, R., Foss, J., Jones J., Ye, J., Smith S.E., Hill, C., Risinger, A., Kero, F. Detecting Drugs of Abuse In Hemolyzed Blood Via LC-ESI-Laminar Flow MS/MS. J Forensic Sci & Criminal Inves 2018; 10(4): 555800. DOI: 10.19080/JFSCI.2018.10.555800. Hemolyzed blood samples are challenging to analyze by liquid chromatography(LC)-electrospray (ESI) -mass spectrometry(MS)/MS due to the complexity of the matrix. Sample-to-sample variability in protein, salts and suspended solids can complicate sample cleanup prior to analysis. It follows that front-end modification of MS instrumentation to accommodate the introduction of “dirty” samples may have a significant impact on modern forensic laboratories. For this reason, a set of hemolyzed blood samples, prepared using solid phase extraction, were analyzed using a PerkinElmer QSight™ 220 triple quadrupole mass spectrometer (PerkinElmer, Bolton, ON) equipped with a -Coaxial Flow ESI - source and HSID™ interface. Further, matrix suppression/ionization was also evaluated utilizing post-column infusion studies. Biological samples were supplied by a forensic laboratory and extracted at Boston University School of Medicine (Boston, MA, USA). The HSID interface was found to reduce chemical background and interference from a complex biological matrix. A total of 31 analytes were optimized for this project and included opioids, benzodiazepines, amphetamines, and antidepressants. The linear range for all analytes was found to be 1-1000 ng/mL. When applying a linear fit, all curves showed excellent linearity with R2 values ≥ 0.989. During the bias and precision evaluation, coefficients of variation (CV) across repeated measurements was found to be within 3-11 % across all analytes. The method was successfully applied to the analysis of 44 forensic case samples, of which 34 resulted in a positive result for at least one analyte from the panel. Extended drugs of abuse panels in hemolyzed blood samples are an important fixture in today’s toxicology laboratory. Accuracy and sensitivity can be challenged by the complexity of this common sample matrix. Combining routine solid phase extraction sample preparation technique with LC-MS/MS instrumentation utilizing unique hot surface induced Desolvation, HSIDTM, results in a reduction of chemical background and significant lowering of interference from the biologically complex matrix . In previous studies by this team, analyzed panels of toxicologically relevant drugs of abuse were measured simultaneously with high precision and sensitivity . The ESI source and self-cleaning HSID interface of the mass spectrometer reduces the need for cleaning between batches of samples resulting in increased throughput making this technique ideal for high volume laboratories. Certified reference materials were obtained for 31 analytes and deuterated internal standards from Cerilliant (Round Rock, TX, USA). Certified drug free blood was obtained from UTAK (Valencia, CA, USA). The liquid chromatography system was an Altus A30 Liquid Handling System (PerkinElmer, Shelton, CT, USA). Chromatography was achieved with a Brownlee phenyl hexyl column, 100x2.1mm, 2.7um (PerkinElmer). All solvents were Optima grade and obtained from Fisher Scientific (Hampton, NH, US). Mobile phase A and B were Millipore water (MilliporeSigma, Burlington, MA, USA) with 0.1% formic acid and 50:50 methanol/ acetonitrile with 0.1% formic acid, respectively. The starting conditions for the gradient flow were with a 0.5 mL/min flow rate. The total run time was 7.5 min. Detection of the target analytes was optimized via infusion using a PerkinElmer QSight™ 220 triple quadrupole mass spectrometer (PerkinElmer, Bolton, ON) equipped with a -Coaxial Flow ESI - source and HSID™ interface (Tables 1 & 2). An injection volume of 10 μL was used and samples were injected in quadruplicate. Calibrators, quality controls, and case samples were prepared for analysis utilizing solid phase extraction (SPE, United Chemical Technologies - CSDAU206 Clean Screen, Levittown, PA, USA) starting with 100 uL of - sample. To each, 1 mL of 100 mM phosphate buffer (pH 6.0) and 25 uL of deuterated internal standards (IS) were added. SPE cartridges were conditioned with 1 mL of methanol followed by 1mL of 100 mM Phosphate buffer (pH 6.0). Samples were loaded and allowed to pass through via gravity flow. Cartridges were washed with 1 mL of deionized water, 1 mL of 0.1N Hydrochloric acid, and 1 mL methanol. Utilizing a positive pressure manifold (United Chemical Technologies) on high (>25 psi), cartridges were dried for 5 minutes. Samples were eluted with 2 mL of base elution solvent (methylene chloride: isopropyl alcohol: ammonium hydroxide at 77:20:3). Samples were dried under nitrogen. 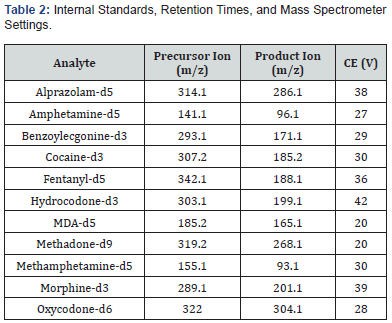 The analytes morphine, BZE, 11-nor-9-carboxy-Δ9-tetrahydrocannnabinol (THC-CCOH), fentanyl, 6-monoacetylmorphine (6-MAM), and hydrocodone were selected to capture the effect of matrix suppression on analytes that elute at the beginning, middle and end of the chromatographic run. A comparison of sample preparation techniques was performed. Protein precipitation (PPT) was completed using cold acetonitrile and 6% formic acid. A solid phase extraction (SPE) method was employed with UCT DAU CleanScreen cartridges. Samples were prepared by SPE following the same format as previously described. HybridSPE®-Phospholipid Ultra depletion cartridges were obtained from Sigma Aldrich (St. Louis, MO, USA). The samples prepared using the HybridSPE cartidges involved using 100uL of matrix with 25 uL of IS and 300 uL of crash solvent (acetonitrile with 1% formic acid). Samples were vortexed for 1 minute. Samples were then transferred to the cartridges using vacuum at 15 in Hg for 2 minutes or until the sample has passed completely through the sorbent bed. Post-column infusion studies were completed using a syringe pump connected to a T union. The T was also connected to the effluent of the column allowing for mixing. The outlet line of the T was directed to the ESI probe. The syringe pumped delivered 50 μg/mL standard solution. Matrix variables were loaded into the autosampler at varying levels to assess the ability of dilution to minimize the effect of chemical noise. A method was developed that allowed for the simultaneous measurement of 31 toxicologically relevant analytes from hemolyzed human blood samples. The method was evaluated for linearity, accuracy, and precision. The linear range for all analytes was found to be 1-1000 ng/mL. When applying a linear fit, all curves showed excellent linearity with R2 values ≥ 0.989. During the bias and precision evaluation, coefficients of variation (CV) across repeated measurements was found to be within 3-11 % across all analytes. Due to the complex nature of whole blood samples, it was also important to evaluate the effectiveness of the sample preparation method. Post-column infusion was performed to monitor suppression events throughout the run. This is beneficial in predicting future issues with quantitation for specific analytes. Ionization suppression was found to be as high as 75 % during the first two minutes of analysis. It was expected that this suppression was caused by the co-elution of polar interferences, such as salts. Although to a lesser degree, ion suppression was still observed at later retention times. By monitoring common MRM transitions of lipids and phospholipids, it was determined that this additional analyte suppression was due to co-elution of phospholipids (Figure 1). The post-column infusion analysis was used to determine appropriate sample dilution levels and for the optimization of the SPE procedure. The detection of phospholipids after SPE inspired an orthogonal cleanup attempt pairing SPE with PPT and phospholipid depletion strategies. These methods added an additional step but allowed for an improvement in sample cleanliness and an overall reduction in chemical noise. A total of 44 post- and ante- mortem case samples were prepared as described. SPE extracts were then analyzed using the verified methodology. 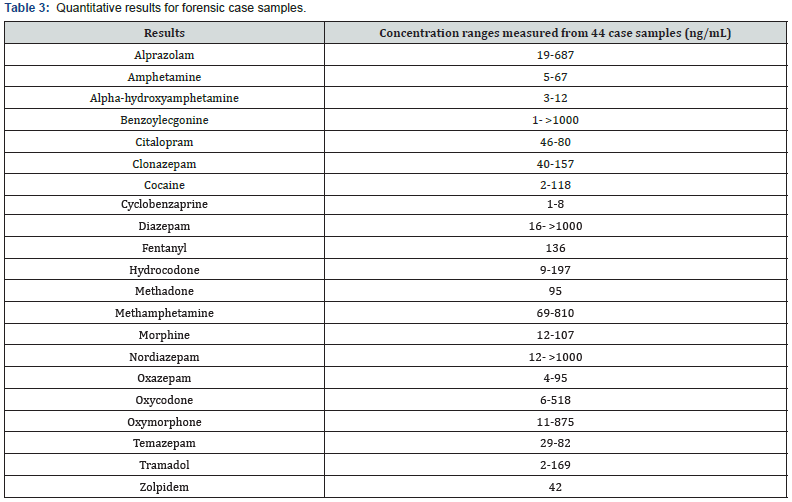 Of the 44 cases evaluated, 34 were identified as positive for at least one or more analytes using the developed method. The analytes alprazolam, amphetamine, alpha-OH-alprazolam, cocaine, benzoylecgonine, citalopram, clonazepam, cyclobenzaprine, diazepam, methadone, fentanyl, hydrocodone, methamphetamine, morphine, nordiazepam, oxazepam, oxycodone, oxymorphone, temazepam, tramadol and zolpidem were detected. 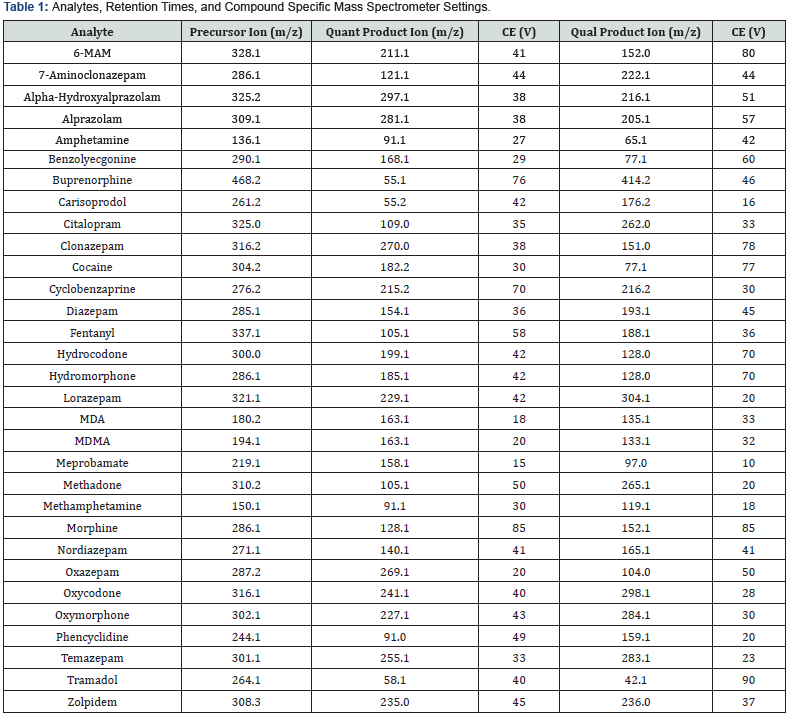 The measured ranges of each analyte across all case samples can be seen in Table 3. Two example chromatograms obtained during the analysis of case samples can be seen in Figures 2 & 3. Within case sample “D6”, a high concentration of the analgesic, tramadol was detected (Figure 2). A commonly abused benzodiazepine, diazepam, along with its major metabolite, nordiazepam were also detected. During the analysis of case sample “D8”, high concentrations of benzoylecgonine were detected, indicating the use of cocaine (Figure 3). A quantitative method was developed that allowed for the simultaneous measurement of 31 known drugs of abuse from human whole blood samples. Solid phase extraction was utilized to reduce the presence of matrix interferences including salts and phospholipids. The method was successfully applied to the analysis of 44 forensic case samples, of which 34 resulted in a positive result for at least one analyte from the panel. The reliable and robust LC-MS/MS method with an PerkinElmer QSightTM series 220 mass spectrometer is an effective combination for modern forensic laboratory or patient drug-use monitoring programs. 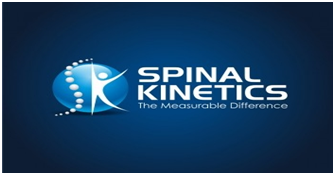 The authors would like to thank PerkinElmer for their use of the instrumentation to carry out this study. Foss J, Botch Jones S, Kero F (2017) Recommendations for the determination of matrix suppression in biological samples by UPLCESI-MS/MS: Extending Quality Measures in Forensic Toxicology” The proceedings of the annual meeting for the Society of Forensic Toxicologist (SOFT), Boca Raton, FL. Botch S, Le Blanc R, Ye J, Kero F, Young C, Schmidt C (2016) The Simultaneous Detection of a Panel of Drugs of Abuse in Post-mortem Hemolyzed Blood Samples (n=40) by LC-ESI-laminar Flow MS/MS HPLC 2016 44th International Symposium on High Performance Liquid Phase Separations and Related Techniques, San Francisco, USA.